Don`t keep the battery in a wrong charging current value, use the right charger at the battery manufacturer's recommended float or maintenance voltage for a fully charged battery. The best charging current value is 0.1C(e.g. 1 cell capacity is 100Ah, C=100A, the charging Current value =0.1C, 10A), the Max Recommended Value is less than 0.3C. If cell charged at high charging rate, the cell voltage will reach a high value, resulting in over charge and H2O separation. Thus, well charge management could slow down sulfation. Our 24V Battery iMaintaining Protector will be your best partner which can help you Stocked Battery Maintenance to prevent sulphating and H2O separating, no overcharged , temperature compensated. 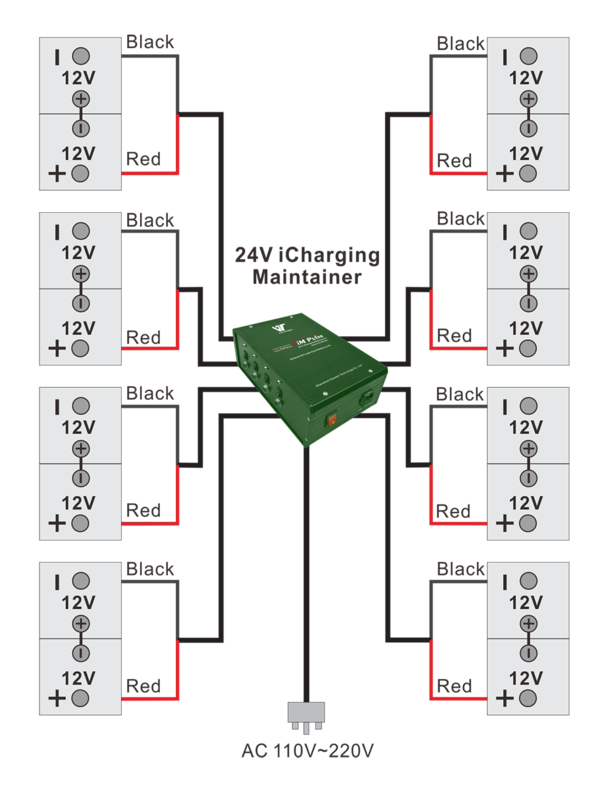 The lead-acid 24VB iMP300Ah Battery iMaintaining Protector, also we can call it as the name of Battery iCharging Protector is applicable to the army and local vehicle repair plants, various battery manufacturers and battery retailers. At present, the battery manufacturers and the battery retailers cannot solve the problems of capacity reduction and failure caused by long storage time of the maintenance-free lead-acid batteries. However, such problems can be solved by using the Battery Charger And Restorer 2-in-1 which is the only effective way to repair the failing maintenance-free lead-acid batteries. Batteries stored in warehouse are always used for emergency affairs such as customer service, sudden accidents and power downtime unpredictably, etc. Uptime is the most basic requirements in nowadays connected to all things in the world. Power systems rely on batteries to provide critical backup energy and power in sudden affairs. When power supply of normal grid is lost suddenly, the backup power systems must perform. Without proper maintenance of the stored battery, you should bear the costly repairs. Battery Repair by Battery Saver of 24VB iMP300Ah is your best choice to solve battery problems. First charge the battery to be used sufficiently; in case of open-type battery, check to make sure the electrolyte level and the electrolyte proportion conform to the provisions. Turn off all switches of the machine and connect the power line with 110V/220V mains socket. Connect the output line of the lead-acid Battery Smart Pulse Charger with the eight output ports of the machine, connect the red clip of the output line to the anode of the battery, and connect the black clip to the cathode of the battery. Turn on the main power switch after confirming that all the connections are correct, then turn on the corresponding branch switch, the green indicator light of the way connected with the battery is normally on, and the Battery Charger and Restorer 2-in-1 starts to Battery Repair as Battery Saver. At the end of maintenance or when the battery needs to be activated, first turn off the branch switch of the maintenance battery, and then disconnect the output line and the battery, otherwise, the machine may be damaged. Looking for ideal Battery IMaintaining Protector Manufacturer & supplier ? We have a wide selection at great prices to help you get creative. All the Stocked Battery Maintenance are quality guaranteed. We are China Origin Factory of Battery ICharging Protector. If you have any question, please feel free to contact us.